Cestusline™ (Cestus) is a specialist manufacturer of industrial gloves designed especially for the mining industry. Our Mining Series gloves are the result of various conversations with industry officials about the weaknesses in the market’s current hand-protection offerings. The Cestus R&D team creates new technologies that can handle some of the roughest working environments in the world. While the mining industry has come a long way, the protective equipment used by miners has undergone a slower development. Cestus was first approached at an industry trade show by a safety manager, who was frustrated by this oversight. The injury statistics in the mining industry can far outweigh other heavy industries, and the manager was actively seeking new technologies that would either prevent or reduce the severity of injuries that were occurring far too often. The first obstacle that Cestus had to overcome was the high incident rate of impact injuries, which are often caused by equipment weighing more than 100lb. Our industry representatives provided us with a list of additional features that pushed our development team to the limit. Miners are often working in extreme, occasionally upside-down, cramped and dark conditions.The shifts tend to be long, so our R&D team also looked into ways to develop the heaviest-impact gloves we had ever made, which include a high-dexterity flex to reduce hand fatigue. Since many miners use impact and power tools, we added vibration-reducing palm pods to one of our models in an effort to reduce the severity of jobsite hand arm vibration syndrome (HAVS) and carpal tunnel. 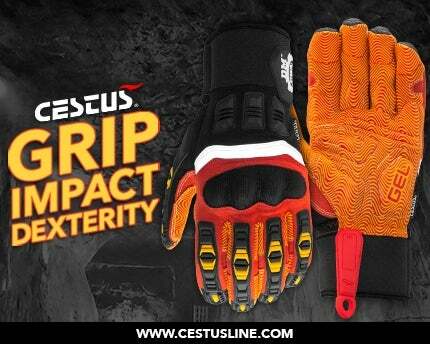 Cestus’s Mining Series currently has three glove models with variable levels of impact protection technology. The DM Hybrid® is our flagship mining glove, which features a moulded polycarbonate knuckle and flexible 3D thermoplastic rubber (TPR) impact-protection shields. An overlooked feature is the TPR impact shields that extend to the wrist and protect the metacarpals and wrist. The palm side of the glove features our patented Ripple Grip® with vibration reducing pods, filled with our exclusively patented Hexagonal Memory Gel®. The Deep II® Grip Miners have the features of two gloves in one. The complete impact protection comprises a single-piece, flexible TPR impact shield that protects from fingertips to wrist. The flared, extended thumb protection is the full-impact protection from thumb tip to knuckle. The Deep II series gloves have TPR, which is thicker and wider than our original Deep Series TPR. The palm side features our bestselling SkidX™ Grip with an under-layer of our exclusive Lastamid®, a 1,600°C flame-resistant fabric. This glove is resistant to oil, water, puncture, flame, abrasion and cuts. The HM® Impact features padded impact protection with our DNX Grip™. Great dexterity with thoughtful reinforcement to the saddle adds durability where gloves tend to wear out. Reflective fingertips make this a great glove for low-light conditions. Adjustable elasticised wrist cuffs keep debris out of the glove. All the Mining Series gloves can be washed by hand and air-dried to extend the lifetime of the glove. We have additional Cestus gloves from our family to meet any job description, as our Pro Series, Welding Series, Handler Series and Trade Series gloves are suitable in many industrial settings. Clients can try out our Mining Series gloves on their jobsites with our Cestus Proving Grounds programme. Qualified end-users can purchase a trial of up to 12 pairs of our mining gloves to experience the Cestus difference for themselves. Named after the ancient Roman battle hand protection worn by gladiators in combat, Cestus creates multifaceted gloves from basic utility and gardening gloves, to oil-resistant and anti-vibration technical gloves. Cestus was founded in 2010 and our management brings more than 30 years of experience in the glove manufacturing field to the table. Combined with user feedback, our expertise in hand protection allows us to manufacture work gloves that deliver in protection, functionality and comfort. A combination of top-of-the-line durable materials, detailed stitching and innovative designs based on end-user feedback make our gladiator-tough gloves that are also comfortable to wear while working. Cestus is proud of the innovative spirit that has led the company to create some of the most durable, ergonomic work gloves available. Cestusline's Deep II Grip Miners gloves are designed for the needs of workers that require strong grip control for working with tools and equipment, as well as back-of-hand protection. When miners need extra protection in dangerous areas, the Deep II® Grip Miners deliver extended back-of-hand protection and a resilient grip. DM Hybrid mining gloves by Cestus revolutionised hand protection in the dangerous mining and ore-refining industries. Mining sites are notoriously dangerous and present hazards from falling and projectile debris to fires and electrocution. Cestusline has developed gloves for workers handling tools and equipment in the mining industry. Cestus supplies the all-new DM Hybrid protective gloves for workers in mining and excavation sites. Download the free flyer for more information. Cestusline Inc., headquartered in Portland Oregon, has introduced many remarkable gloves over the years, and Deep Grip Winter is no exception. Modelled after their best-selling Oil-Resistant Deep Grip Impact glove, Deep Grip Winter's insulation, MicroSable™, is what sets it apart from other insulated oilfield gloves. An international company specialising in hand protection Cestusline (Cestus) has received outstanding feedback on its newest mining glove, DM Hybrid®. Originally created specifically for the underground mining industry, DM Hybrid is changing the way miners are dealing with hand protection.